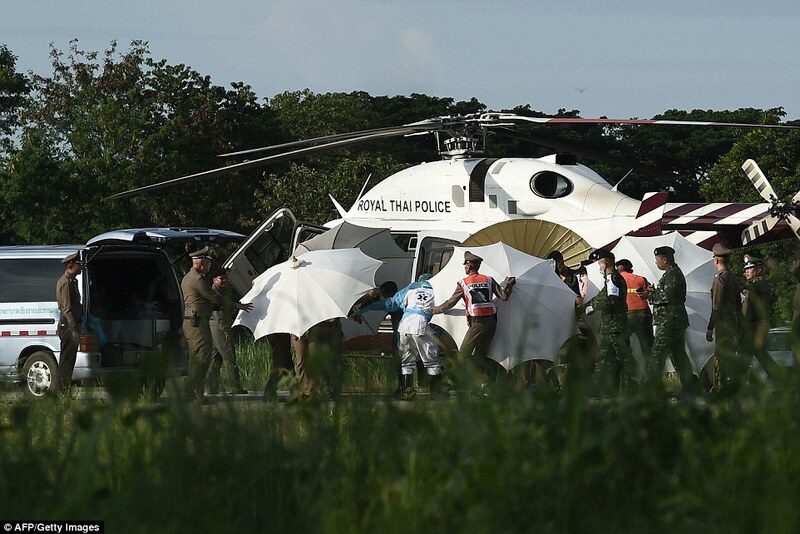 Three more members of a Thai youth football team trapped in a flooded cave for 18 days have been rescued and carried out on stretchers to waiting ambulances, leaving just one boy and their coach still stuck underground. Relatives of the one of the Wild Boar FC players said boy number nine was brought out shortly after 4pm local time (10am UK time), and number ten some 15 minutes later. The 11th rescued child emerged an hour after the ninth. 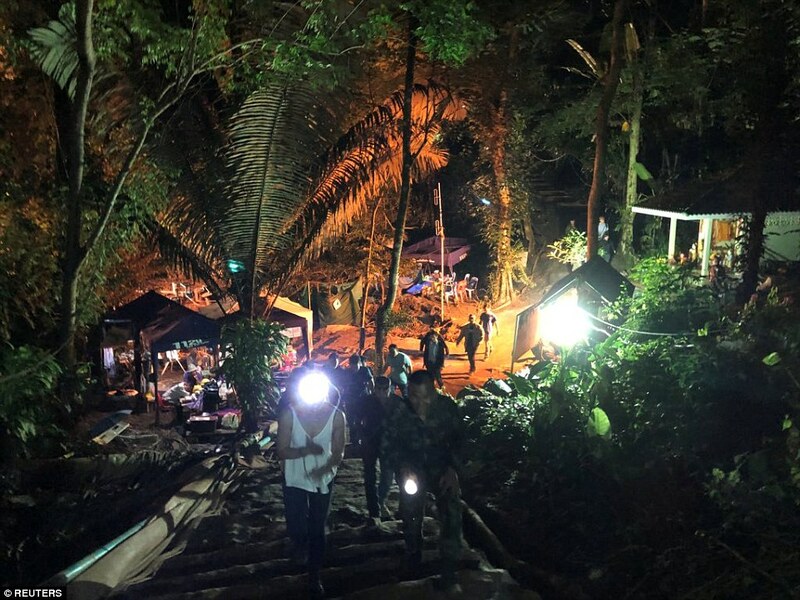 The ninth rescue has since been confirmed by Thai Navy SEALs, who are leading the operation to rescue the final four school boys and their football coach that began this morning. 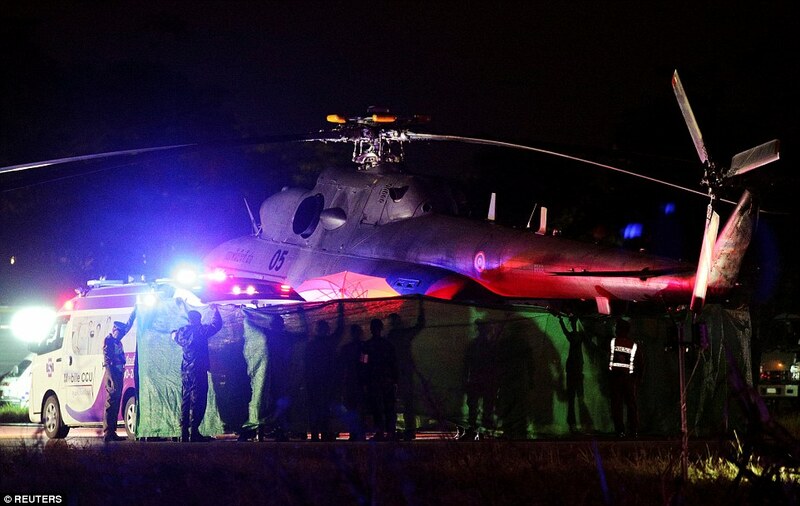 As well as the remaining players and their 25-year-old coach, there are four Thai Navy SEALs - including a medic - who will be extracted once the team are freed today. 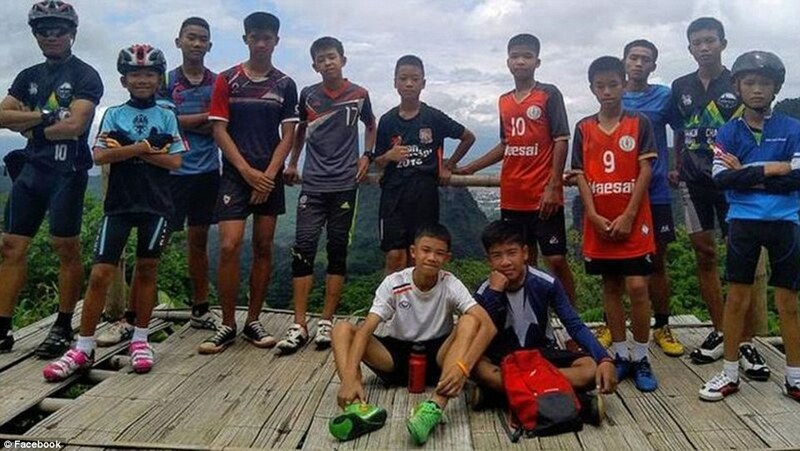 They have been staying with the trapped school boys since they were discovered huddled together on a muddy ledge 2,620ft (800 metres) underground on July 2. 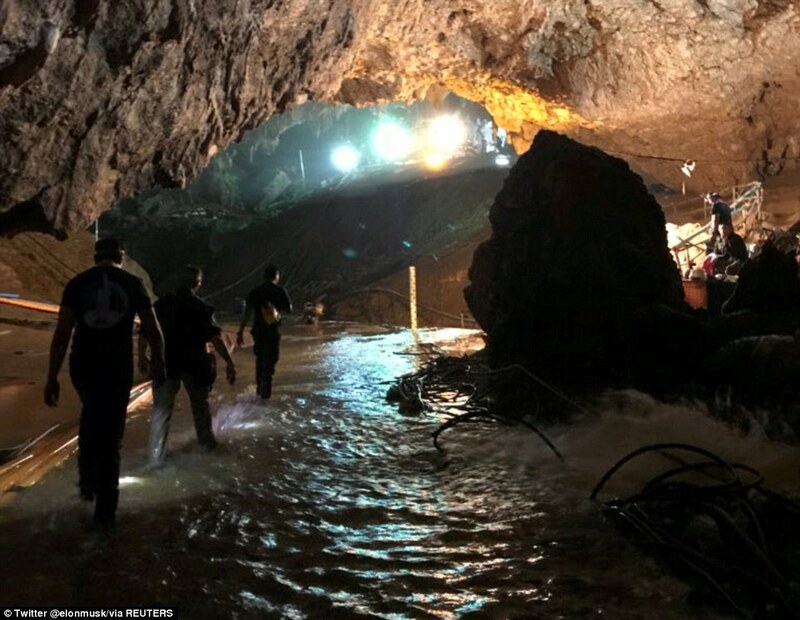 The rescuers are determined to get the final five out of the Tham Luang Cave in Chiang Rai, northern Thailand, before the monsoon rains make an evacuation impossible. 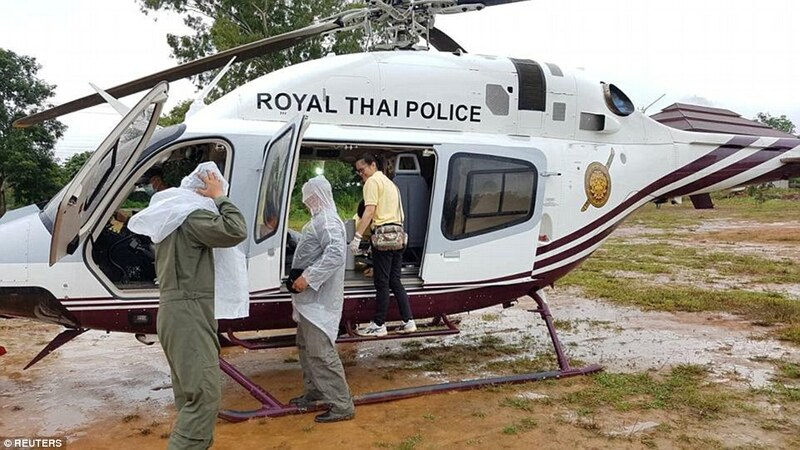 'The water level is almost at the same level as for the first two days so we decided to carry out the operation for the last batch,' Governor Narongsak Osottanakorn said. 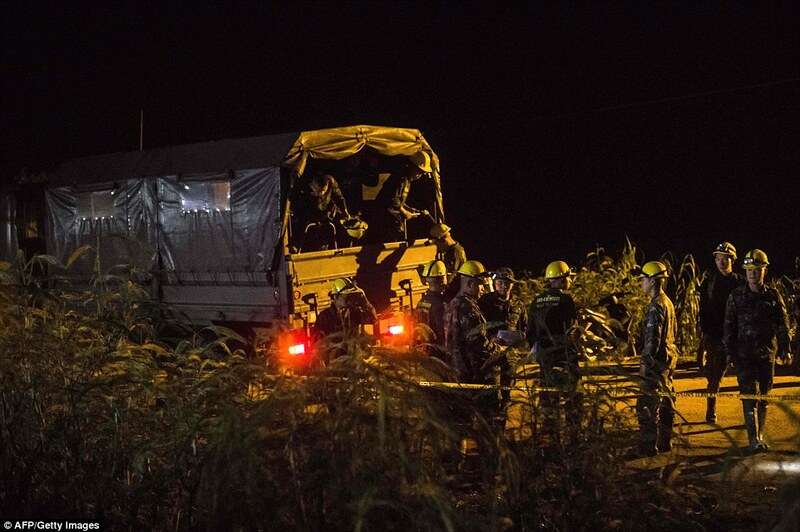 The operation to rescue the remaining four boys and their coach began around 10am local time (4am UK time) on Tuesday. Officials also announced the first group of four to be evacuated are aged between 14 and 16 and the second group are aged between 12 and 14. That means that 11-year-old Chanin Wiboonrungruang, whose nickname is Titan, remains trapped in the dark cave. Officials last night suggested coach Ekaphol Chantawong, 25, could face a night underground alone because the divers' system of extracting four boys at a time was working well - but rescuers said all those remaining will be brought out today. As the final day of the mission began, the rescued children have been praised by a Danish diving instructor who was part of the team helping to guide them out through the water-filled tunnels. 'They are being forced to do something that no kid has ever done before,' Ivan Karadzic, told the BBC. 'It is not in any way normal for kids to do cave diving aged 11. They are diving in something that is considered an extremely hazardous environment, in zero visibility, the only light in there is the torches you bring yourself. Two of the eight boys rescued so far are being treated for pneumonia and the other six have hypothermia, a Thai doctor revealed. The first eight to be evacuated have all been given inoculations against rabies and tetanus, and are all being treated with antibiotics amid fears they may have been bitten by disease-carrying bats inside the huge underground network. 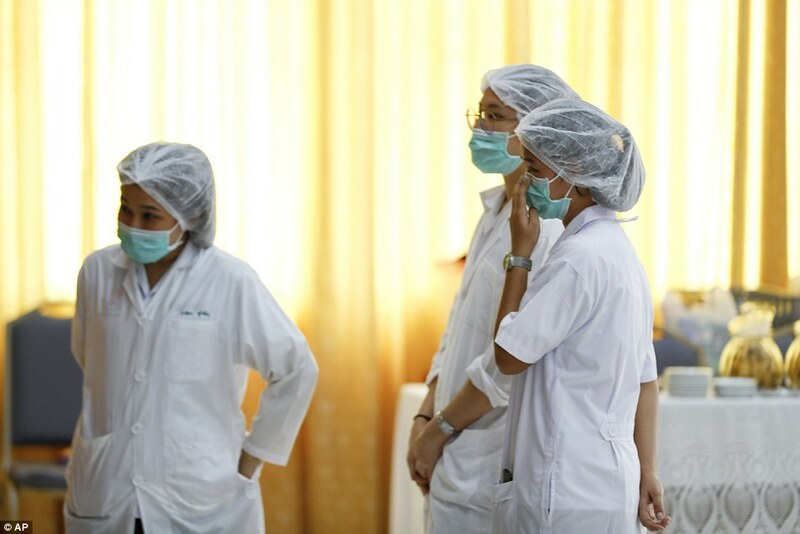 The boys are weak and ravenously hungry, Thailand's public health chief Dr Jedsada Chokdamrongsuk revealed, but have been laughing and joking with staff and officials. Among the first things the children told medical staff were 'we miss home' and 'we're happy', he added. However, they are unlikely to be well enough to take up FIFA's invitation to watch the World Cup final in Moscow later this week. 'These boys are being treated with antibiotics. All of the boys were suffering from hypothermia when they arrived at the hospital,' Dr Jedsada said. 'But they have all now reached normal body temperature. The hypothermia could have been a result of diving for several hours. 'All of the boys have been given inoculations and rabies inoculations because of the concern that they may have been bitten by bats which live in the cave. The doctor said blood samples taken from the boys will be sent to a specialist lab in Bangkok to test for 'emerging diseases'. 'But parents and other families members must remain two metres from the boys and must wear surgical masks and robes when they visit them,' Dr Jedsada said. Dr Jedsada said in general the boys are in good spirits. 'They are very talkative. They were laughing and joking with the prime minister [General Prayut Chan-o-Cha] when he visited them last night. But he said the boys would remain in hospital for at least a week and were unlikely to be well enough to travel to Russia for the World Cup final on Sunday. Incredibly, they could not even swim before their ordeal, and were pulled along through the tunnel with the help of expert divers, including some from Britain. 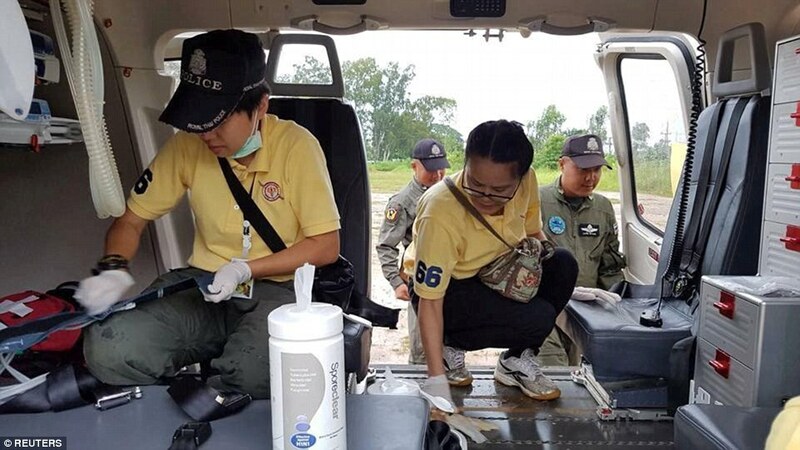 That boy and at least one other had to be airlifted to Chiang Rai Prachanukroh Hospital, where the first four children from Sunday's rescue mission are recovering. From their dedicated ward, the boys have demanded meals of pad krapow – a Thai comfort dish made from spicy pork, basil leaves and rice. On doctor's orders they are getting no more than baby food, Mr Osottanakorn revealed. 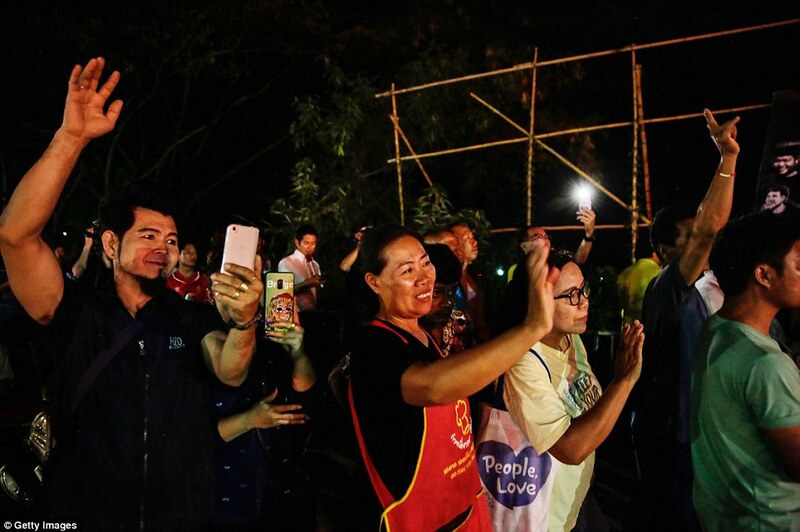 The relieved parents of the rescued Thai school-boys beamed with delight after visiting their beloved sons at hospital last night. 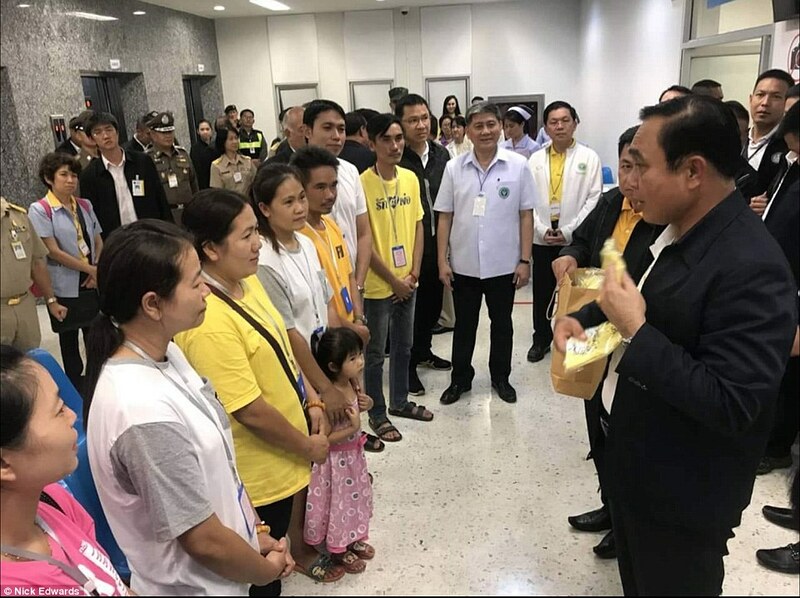 The relieved parents – and at least one little sister - can be seen smiling and clearly relieved as the talk to General Prayut. Among the group were the parents of Pipat Phothi, known as 'Nick' and Ratdao Janthapoon, the mother of Prajak Sutham, known as 'Note'. Earlier the prime minister visited the rescue operation centre in front of the cave entrance and met Thai military officers, cave diving specialists – including the British pot-holers – and the all the rescue workers. Pictures of General Prayut's visit to the rescue site and the hospital were released by the Thai government last night. The boys are being monitored for breathing difficulties, hypothermia and an airborne lung infection known as 'cave disease' caused by bat and bird droppings which can be fatal if untreated. Once again, British cave experts spearheaded yesterday's operation which involved more than 100 divers. Seven Britons chaperoned the boys through the treacherous tunnels as part of a team that included 18 international cave divers and five elite Thai navy SEALS. 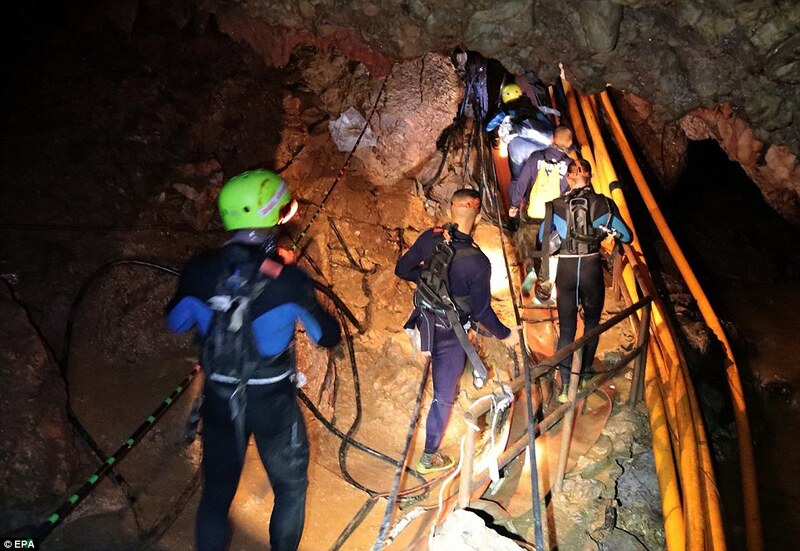 Scores of other volunteer cave divers from around the world helped by delivering air refill tanks and tightening the guide rope along the route, which includes ten 'choke points' where the mud-clogged tunnel is terrifyingly narrow. Friends of the British experts claimed they 'never panic' under water and would be keeping reassuring eye contact with the children. Wearing full-face masks, the boys either swam or were pulled along. Yesterday's nine-hour mission – starting at 11am – was two hours shorter than Sunday's.